Update April, 2019. My portfolio is woefully out of date. Until I update it, here are some recent sites I’ve built. Do you need a new website or website update? Contact me – I’d be happy to chat with you. 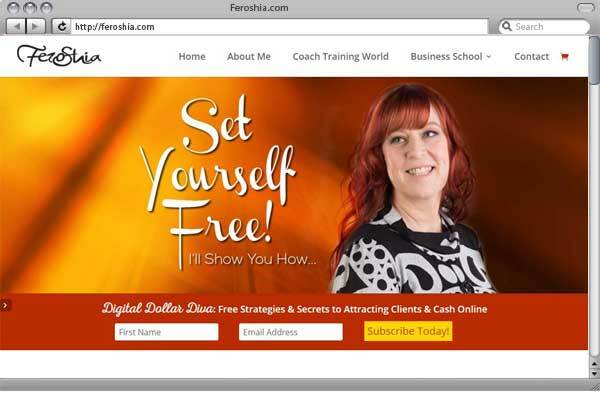 Feroshia Knight, the founder of Coach Training World, had finally had enough with her old website. We referred to it as Frankenstein, because we often had to inefficiently cobble together bits and pieces to make things work the way she wanted. There were many aspects of her old site that made it difficult for her to update the site. So it was important that her new site was relatively easy for her to update. 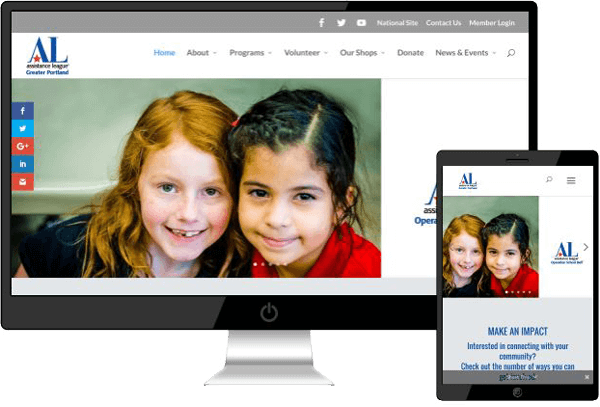 I helped her build a new website that was not only more user friendly and appealing but much easier for her to update and to add content. Feroshia created the graphics and color scheme. Because of the user friendly theme we co-developed the site and I tackled the more challenging technical parts. Ability for people to easily schedule appointments with her online and have these appointment automatically added to her calendar. MailChimp integration for email campaigns, free ebook, and other automations, such as automated course delivery. 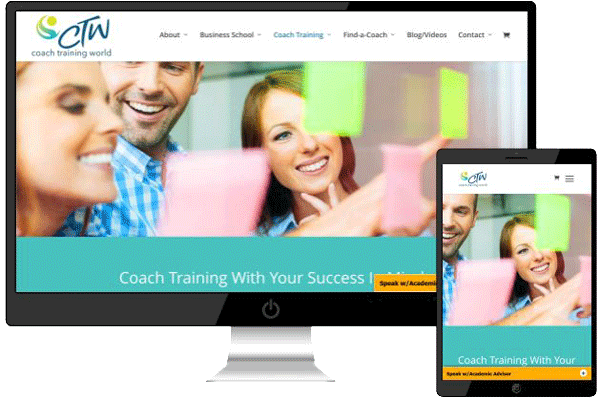 Ability for visitors to view a Coaching Directory of Coach Training World graduates. In person training on how to edit her site using best practices. 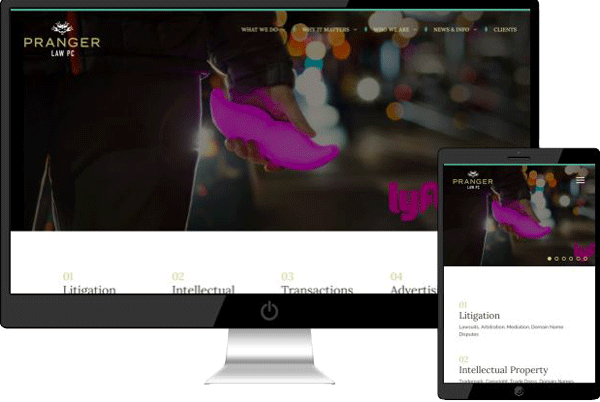 Pranger Law PC is a law firm out of the bay area that wanted a new modern and responsive website. I served as the developer on this project and provided recommendations for plugins and other digital tools. The client provided the bulk of the graphic design and layout. This in an example of a site that was completely designed in Photoshop that I brought to life in WordPress. Building this site required substantial customization to meet their demanding expectations. Provided training on how to edit and update their site. On the Clients page, created a custom hover for logos of companies that have been acquired by another business. Implemented certain features that were compatible with retina displays. Their old website was outdated and not easily viewed on mobile devices. Plus they were looking to reduce their yearly web maintenance fees. In person training on how to update the site. I served as the developer on this project and provided recommendations for plugins and digital tools, such as Buffer for managing social media campaigns and LastPass for managing passwords. The client provided the bulk of the graphic design and layout. The Divi WordPress theme was used to create this site and required substantial customization to meet the client’s needs. Mailchimp integration: Set up lists and email templates for free E-book and email newsletter. Membership site built with the WishList Member plugin. E-commerce shopping cart integration that allows either single payment purchases or recurring payment options. Substantial CSS and PHP modifications of the theme. Click here to see examples. NOTE: As of April 2016 this site is undergoing some major changes. 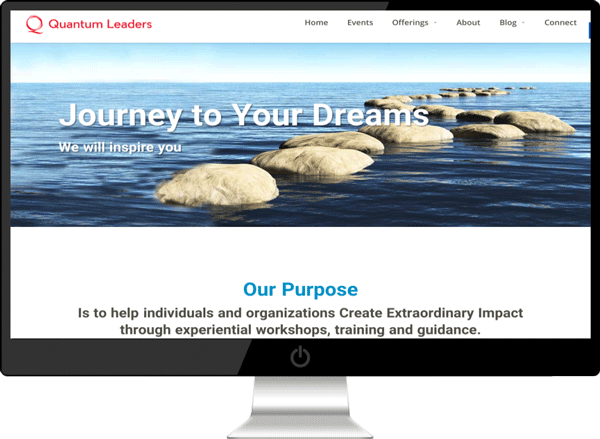 Norman & Jane, the founders of Quantum Leaders, had struggled with other web developers to capture their essence and to bring cohesiveness to their diverse offerings. Working together we created a site they were happy with and that was well received by their audience. I created the majority of the layout and images and built the site. Maria Guerriero of Germinate Creative did a great job creating the color pallet and adjusting their existing logo. Saved them over $500/year in fees by migrating their email list from Constant Contact to MailChimp. MailChimp integration – Set up lists and email templates for a free article and email newsletter. Events Management – Ability to list one time and recurring events and show an events calendar. E-book – Ability to purchase and download E-books. Provided in person training and written guides on how to edit their site and manage event listings. I designed and built this business Facebook page which has resulted in a signficant amount of new business. 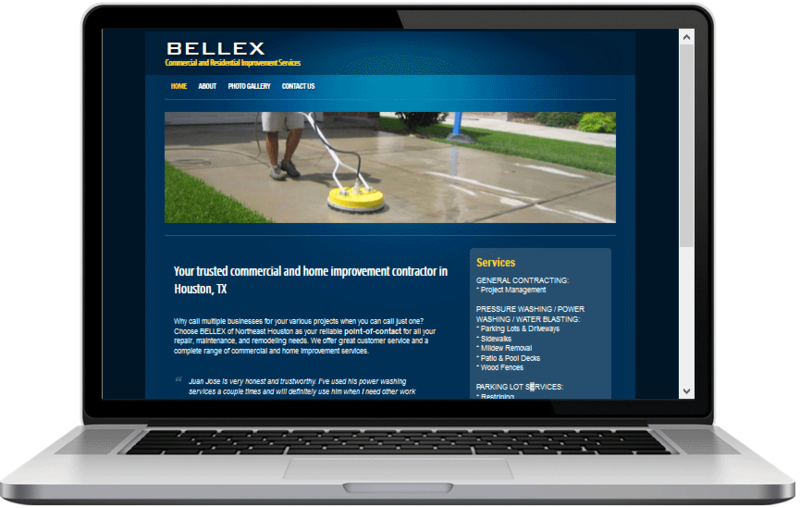 It also ended up being a good way for potential customers and new customers to interact with Bellex Services. 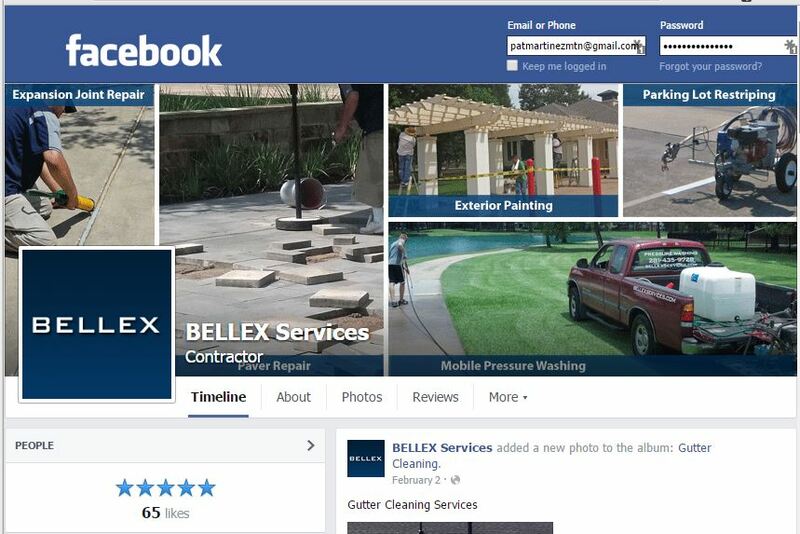 I was responsible for updating their existing website and to build and integrate a Facebook page. I also inherited a “White Screen of Death” issue that I was able to fix. Made the website responsive by updating the theme. Included clear calls to actions throughout the website. Rebuilt the photo gallery page. Made several page formatting modifications via CSS and modifications to the PHP files.